Over the years I have hiked up Millard Canyon in Pasadena many times, usually to visit the well known Dawn Mine. On these trips I paid little if any attention to a side tributary called Saucer Canyon. Recently I was advised of a mine located in that canyon. The only written record I have found of the mine is contained in John Robinson”s. 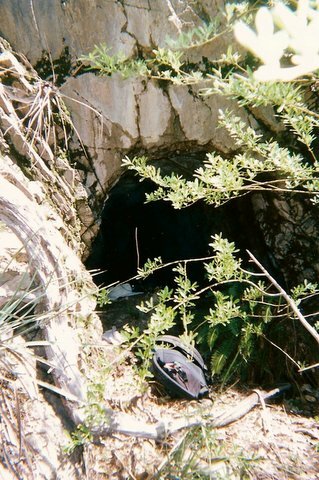 Mines of the San Gabriels.Robinson writes that an unknown propector dug a short tunnel there in the 1920’s. A nearby cabin was suspended in mid-air by steel cables. The cabin was later carried away in a rockslide and the mine was abandoned. I was advised that the mine was near the highest waterfall. Saucer Canyon got its name from several falls with saucer-like pools located near where the canyon enters Millard Canyon. I started working my way up the left side of the canyon where there appeared to be a faint trail while attempting to avoid numerous patches of poison oak. After several hundred feet the ascent became more and more difficult with ever increasing exposure. I finally found myself standing on a narrow uneven ledge with a steep cliff face on my left and waterfalls far below me on my right. One misstep and I would do a swan dive 80 feet down to the bottom of the highest falls. At this point I noticed some webbing and rope attached to the ledge in front of me. I held on to the rope for dear life and worked my way upward on the ledge until I reached a flat, bushy area. To my disappointment I found no sign of any mine in the area. I then carefully worked my way down wondering how I could have been so heedless to have gotten myself in this predicament. I later learned there is a flagged trail on the right side of the canyon which is much safer. Later I also learned that the mine is located near the head of Saucer Canyon about a mile above my initial exploration. So a few days later I hiked out to Tom Sloan Saddle from the Mt. Lowe truck road and from there went up a ridge top firebreak leading to Brown Mountain. About a half-mile before Brown Mountain I reached the head of Saucer Canyon and proceeded to head down. About 1200 feet down I ran into metal debris and found myself at the top of a 20-foot dry fall. Working my way around the bottom of the fall I found the mine entrance partially obscured by a bush. Alas it only went in 35 feet. My appreciation to Professor Christopher Earls Brennen of Cal Tech both for furnishing me with the information which enabled me to find the mine and for installing the webbing and rope which greatly assisted my earlier climb. 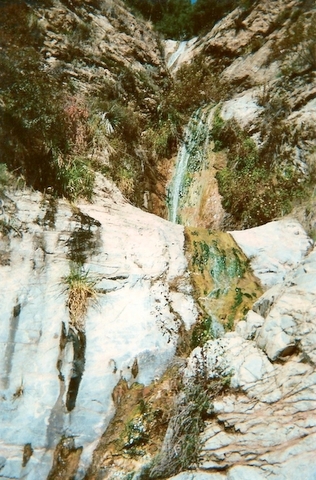 Professor Brennen’s web site contains information on Saucer Canyon and other adventure hikes in the San Gabriels and other areas.